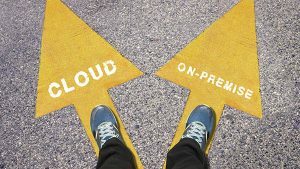 Cloud ERP or On-Premise: Which Is Right for You? Considering new ERP software for your machine shop? Only a few years ago, the search for new ERP software would have been focused on which provider was right for you. Today, there’s an additional question you’ll need to address first: Do you want software installed on-site or cloud ERP? The ERP software has changed dramatically in recent years due to the introduction of cloud-based ERP software. Cloud-based systems have become increasingly popular across many industries, and manufacturing is no exception. While on-premise ERP has been the traditional choice, you may be wondering whether cloud ERP could be a better option. If you already have an on-premise system, you could be considering a move to the cloud. Below are descriptions of each ERP option, along with benefits and important considerations. Do your due diligence and base your decision on your unique needs and objectives. On-premise ERP software is one that is installed locally on a server in your facility. Historically, most ERP programs have been on-premise. It’s often helpful to frame the choice between on-premise and cloud-based as a choice between buying and leasing. In that analogy, on-premise would represent the “buy” decision. With on-premise ERP, you own the software. That means you’re responsible for maintaining the system, resolving any issues or problems, and updating it periodically. The provider may offer service and support, but that likely comes with an additional fee. Also, you’ll be responsible for maintaining the server, network, and other hardware needed to implement the software. Another consideration with on-premise is cost. On-premise systems often have a sizable upfront capital investment. You have to buy the software, but you also may need to purchase servers and other hardware. Depending on your cash flow outlook and your financial situation, you may find it difficult to make a significant outlay upfront for new software. Cloud-based ERP is deployed much differently than on-premise systems. As the name suggests, cloud-based software is deployed through the cloud. That means it is hosted on a server with the provider, and not on a server in your facility. You access the software by signing-on through the internet. As long as you have an internet connection, you have access to your software. This difference in deployment is an important distinction. You don’t need servers or other hardware installed in your facility. You’re not responsible for maintenance, upgrades, or issue resolution. You only pay a monthly fee to access the software. In this sense, cloud-based software is the “lease” option. Another important aspect of cloud-based deployment is that it offers flexibility. You and your team can access the software from anywhere, including your home, a customer’s location, or even from your car. You get cost flexibility because there is no sizable upfront investment. And the software itself is flexible because you can upgrade and add features at any time without having to purchase a new software package. Cloud-based ERP offers some appealing benefits, but there could be reasons why an on-premise solution is a better fit. Maybe you would rather pay most of the cost upfront rather than an ongoing monthly fee. Perhaps you have the resources needed in-house to support an on-premise solution. Maybe you prefer to “own” your software rather than “lease.” Cloud-based isn’t always the right choice. However, more and more shops are finding that cloud-based machine shop software is the right choice for their business. Contact us at Shoptech to learn more about both our on-premise and cloud-based solutions. We welcome the opportunity to help you meet your needs and objectives.